There are several types of insulators but the most commonly used are pin type, suspension type, strain insulator and shackle insulator. 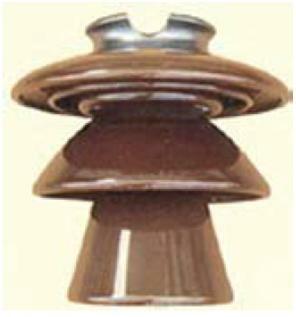 As the name suggests, the pin type insulator is secured to the cross-arm on the pole. 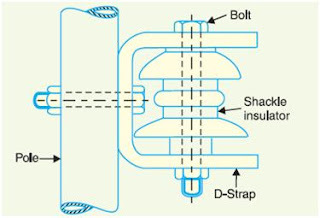 There is a groove on the upper end of the insulator for housing the conductor. 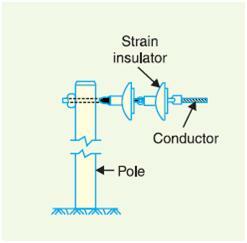 The conductor passes through this groove and is bound by the annealed wire of the same material as the conductor. Pin type insulators are used for transmission and distribution of electric power at voltages upto 33 kV. Beyond operating voltage of 33 kV, the pin type insulators become too bulky and hence uneconomical. 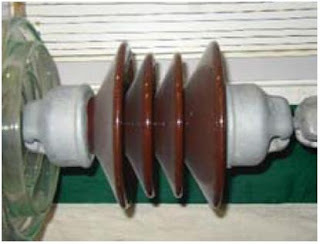 For high voltages (>33 kV), it is a usual practice to use suspension type insulators shown in Figure. 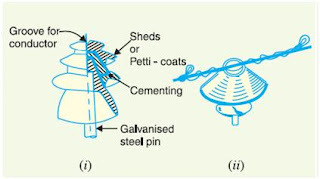 consist of a number of porcelain discs connected in series by metal links in the form of a string. The conductor is suspended at the bottom end of this string while the other end of the string is secured to the cross-arm of the tower. Each unit or disc is designed for low voltage, say 11 kV. The number of discs in series would obviously depend upon the working voltage. 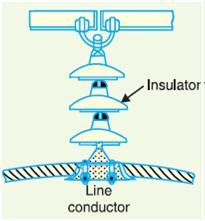 For instance, if the working voltage is 66 kV, then six discs in series will be provided on the string.